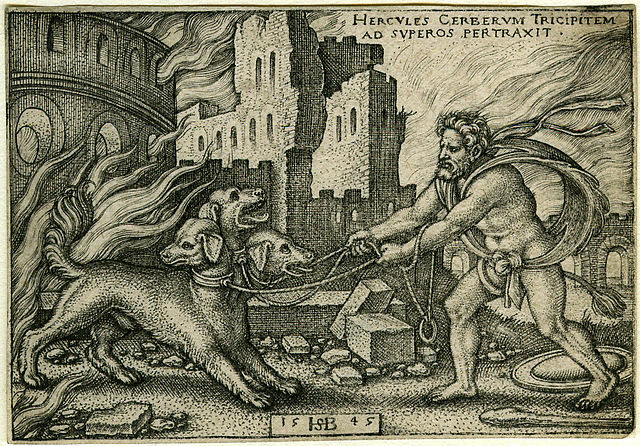 Cerberus (Kerberos), the hound of Hades, is a legendary three-headed dog of Greek and Roman mythology. Like his counterparts the four-eyed Norse dog Garmr and the jackal-headed Egyptian god Anubis, Cerberus is the guardian of the gates of the Underworld, tasked to keep out the living and keep in the dead. His back is covered by a mane of snakes, and his tail is described as being that of a dragon or a snake.